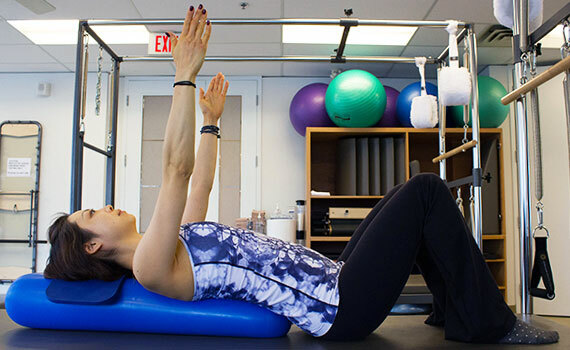 Lead Instructor Trainer Rie Sakamoto demonstrates the proper way to execute Seated Extension over Inflatable Body Roller. This position can be used for scapulae isolation exercises, breathing or spinal release exercises. Answer: Photo A. 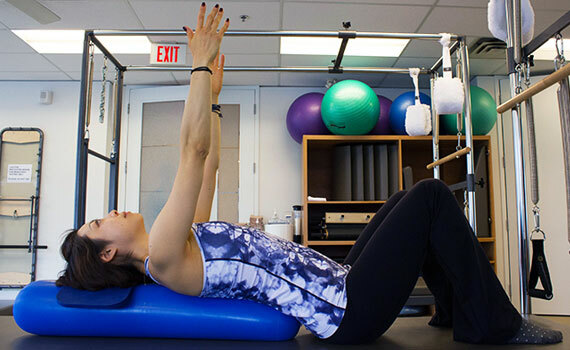 Here, you can see that Rie’s full spine is slightly extended, with the thoracic/cervical spine supported by the roller, with a pad under her head to prevent hyperextension of the cervical spine. The pad can be used as needed. In Photo B, Rie shows poor form, with hyperextension in the cervical spine, protracted scapulae in the starting position, and a bit too much extension in the lumbar region. Need Advice on Mindful Movement? Challenge our panel of experts with any question you may have on Pilates or other forms of mindful movement and we’ll respond accordingly. Ask the expert and your question may be featured in next month’s newsletter!